← ERIC WALSH. Donald Trump and Kim Jong-Un. IAN McAULEY. Strong employment growth, until you look behind the figures. The ABS monthly employment data released last Thursday shows that since the Coalition was elected five years ago the Australian economy has generated one million additional jobs. Does this indicate success of the Coalition’s policies? In the long campaign preceding the 2013 election, Tony Abbott promised that, if elected, the Coalition would “deliver a million new jobs over five years”. On Thursday the ABS released its monthly Labour Force Survey, showing employment growth of 14 000 in March. 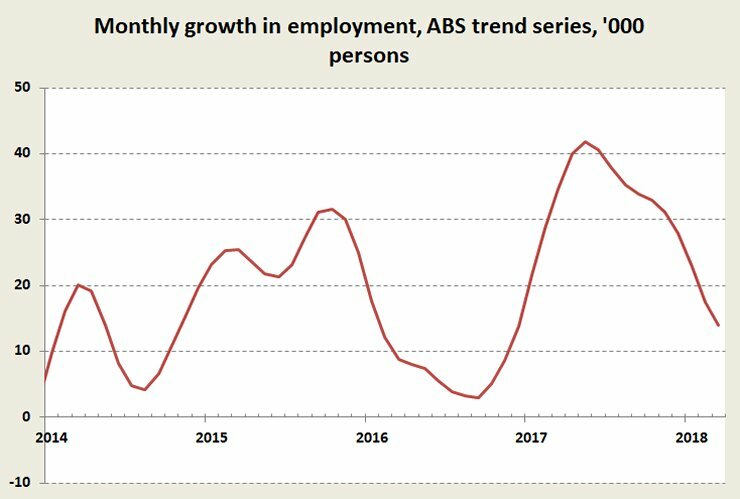 That brought the employment growth between September 2013 (when Abbott was elected) and March 2018 to 1 011 000. Let’s say a million to keep the arithmetic easy. Mission accomplished, six months ahead of schedule. But there are a few qualifications. First, over that period Australia’s population has grown. It would be amazing if employment didn’t more or less keep pace with population. Of those million jobs, 820 000 or 82 per cent simply reflect population growth. Only 180 000 jobs can be considered to be “new”, as a result of the employment-to-population ratio having edged up a little (from 61.1 to 62.0 per cent). Second, of those million jobs only half have been full-time. Had our economy maintained its full-time to part-time jobs ratio over that five years, there would be another 170 000 Australians in full-time employment. The “new” jobs are part-time. Third, in terms of employment growth this may be as good as it gets. The long recovery from the 2008 crisis and the recovery from the end of the mining boom both seem to have run out of fizz. For a time early last year there was strong employment growth, but subsequently it has fallen away sharply, as shown in the graph below. And I almost forgot to mention the stagnation in wages in real (inflation-adjusted) terms over the last couple of years. If wages are held low enough for long enough, particularly if welfare payments for the unemployed are denied or kept at a pauper’s level, there will be jobs on offer – delivering pizzas, collecting supermarket trolleys and walking dogs. If, through suppressing union activity and under-funding agencies charged with enforcing labour conditions, wages can be brought down far enough, there might even be a return of low-productivity jobs we thought had gone forever – shining shoes, carrying bags, serving gasoline, and operating elevators. That’s where lies one of the fundamental weaknesses in our economy. It is not generating enough opportunities for high-productivity and well-paid employment. It has become too easy for employers to underpay workers and to keep them in low-productivity activities. And those same underpaid workers, understandably, aren’t spending. Some have tried to sustain living standards through borrowing, but once one’s credit card is “maxed out” there’s no option but to cut back, not only on discretionary spending (as if workers on minimum wages are really buying crushed avocado) but also on essentials. The dynamic of successful capitalism is that well-paid workers keep markets operating, while poorly-paid workers cause the system to collapse. Karl Marx and Henry Ford both understood the dynamic nature of a capitalist economy: Marx saw how a drift to low wages would lead to capitalism’s demise, while Ford saw how raising wages would protect capitalism by sustaining a market for cars and other products. By contrast our Coalition politicians, whose economic models are an incoherent mix of feudal conservatism, crony capitalism and market libertarianism, just don’t understand how an economy works. “Jobs and growth” is their mantra. But not every job is a good job, particularly when job-seekers lack the support of a strong union movement unions and when the government is less than vigorous in enforcing labour standards and in closing down the cash economy. Some jobs, such as truck-driving in the highly competitive and laxly-regulated road transport industry, are dangerous. Some others, such as parading outside shops wearing advertising sandwich boards, are degrading and humiliating. Many jobs carry the risk of bullying and sexual exploitation. And there are still soul-destroying short-cycle jobs in many industries which could be eliminated if minimum wages were high enough to encourage automation. Also, not every job adds value to the community. Over last week we have seen the extraordinary negative contribution of so-called “financial planners”: we would surely be better off if these jobs had never existed. There are many other jobs, often well-paid, of doubtful or negative value – in advertising, public relations, gambling, consulting and corporate lobbying. “Jobs and growth” is not an economic policy; it’s a vacuous three-word-slogan. An economic policy designed to create and share prosperity would see an integrated set of measures to improve our education standards, to help move our economy from a resource-extracting (and polluting) industrial structure, to discourage the waste of human capital in low-paid-low-productivity activities, to reduce the unproductive overheads of sectors such as finance and corporate legal services, to invest in transport and communication infrastructure, to raise enough taxes to provide needed public services, and to strengthen unions and other agencies that protect against exploitation of those with weak bargaining power. In such an economy work and income could be much better shared than it is now. But unless it has the chastening experience of a couple of terms in opposition, don’t expect the Coalition to learn its economics. It has too many cheerleaders in industry lobby groups and in partisan media urging it to stay on its present track. The Australian’s editorial in response to Thursday’s employment figures was headed “Government must tell its economic story to survive”, as if the government’s poor opinion poll showing is all a failure in public relations, not a failure in policy. And there is a common belief, confirmed by opinion polls, that many people believe that Coalition governments provide better economic management than Labor. The reality is that with the help of a partisan Murdoch media, a tame ABC, a politicised public service, and a poor level of economic understanding in the community, the Coalition has developed its real strength in impression management – perhaps even in a measure of comforting self-delusion – but certainly not in economics.